Saturation. Its one of those words we throw around a lot. But what does it mean? To me, I equate it with a sense of thickness in the sound. A slightly overdriven signal, usually in the low or low mid part of the frequency spectrum. We often use the term distortion to describe it as well. You know, the “pleasing” kind of distortion. In the analog world, we got it by driving a signal slightly too hot onto tape. It was quantifiable, deliberate, and had a definite quality and sound to it. In the world of DAW plug-ins, there are lots of options. Some subtle, some not so subtle. Some pleasing, some deliberately nasty. There are as many flavors of saturation as there is ice cream. However you want to define it, attaining the mythical saturation sweet-spot is a bit of voodoo in our digital word. Logic Pro users have had some tools in the past to create this kind of thickening effect. Many, myself included, often use the Distortion plug-in. Driving the signal, and then reducing the output by the same amount, results in a noticeably pleasing thickening effect. The Tape Delay has been used for years to create a subtle tape saturation effect. Running an audio signal through the plug-in, with no delay or feedback time, emulates the tape saturation effect nicely. Logic Pro X 10.4 has brought us the old Camel Audio Phat FX multi-effects plug-in. At first glance, this is a spectacular sounding multi-effects plug-in, loaded with nice modulation facilities and several FX modules. But it’s got a hidden secret weapon. A three-stage distortion unit with a variety of algorithms ranging from subtle to aggressive. My new favorite mixing tool is to turn off all the modules in Phat FX and then enable only the Distortion module. The Soft Saturation and Vari-Drive algorithms in particular sound to me like the perfect saturation tools to thicken up almost any signal running through it. Add to that the tuneable Bass Enhancer module, and this moves Phat FX into the realm of master bus mix tool extraordinaire! I also love that you can modify Phat FX's signal flow, so the three components can be placed in any order. Maybe you want the bass enhancer feeding into one or both of the distortion/saturation stages. Or perhaps you want the bass enhancer after both of them? Each combination results in subtle variations. The mix control in the Output section allows you to further control the effect, by blending the amount you want into the summed signal at the output stage. Maybe you want to drive some heavy saturation into the signal but only use a little bit of it. Or perhaps some subtle amounts, but higher up in the blend with the dry signal. Again, all the permutations and variations yield exciting results, depending on how aggressive you want the effect to be. The first two have Phat FX on the mix bus. First, you will hear the mix unprocessed by Phat FX. That is followed by the same musical segment with a subtle amount of soft saturation and vari drive, combined with a bit of bass enhancer. The bass enhancer is placed between the two saturation stages, and the output section is set to subtly fatten up the signal with minimal volume changes. All stages are used conservatively. The result is a delicate yet noticeable cohesiveness (dare I use the word glue!) to the summed elements. Listen either with headphones or good monitors to get the full effect. To be fair, let’s not throw out our old tools just yet. Although not all shiny and new, they still pack a nice punch. Here is the same musical example but with Logic Pro’s venerable Distortion plug-in replacing Phat FX. Again, it is on the master bus. It is bypassed in the first example and enabled in the second. 6 dB of drive is added to the signal, while 6 dB is attenuated at the output stage of the plug-in. No article of this nature would be complete without including Logic’s Tape Delay. Here the same example is used. First dry and then wet. The delay and feedback time are completely off. The frequency range is wide open. A nice warm blending of the signal results when the wet tape delay signal is added. Because the dry level is completely off, only the saturated part of the signal is heard. Of course, blending the dry and wet together yields perfectly useable and interesting results. But this example illustrates the tape delay saturation on its own. They are all interesting in their own way. I for one though am thrilled to have these new Camel Audio based algorithms available to add to the collection of useful master bus “glue” style processors. It’s fabulous as a general multi-effects processor, especially with its deep modulation capabilities. But these saturation elements are fantastic on their own as well. 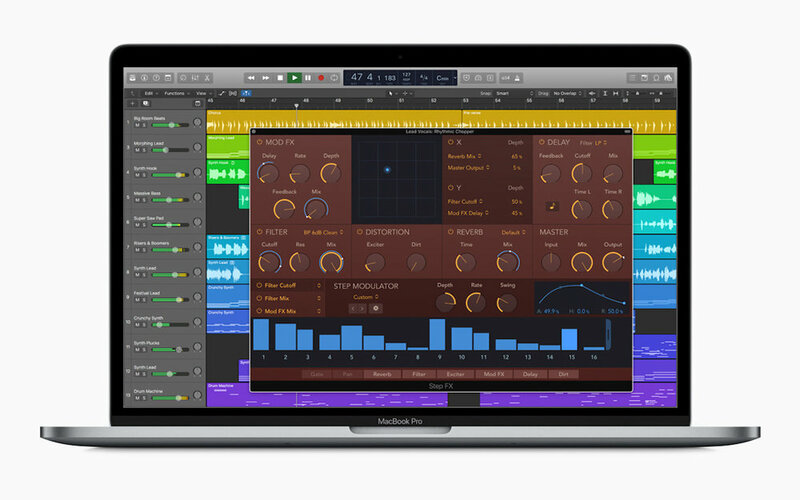 Never before has Logic Pro had as comprehensive a set of internal mix bus style plug-ins available without third-party add-ons.